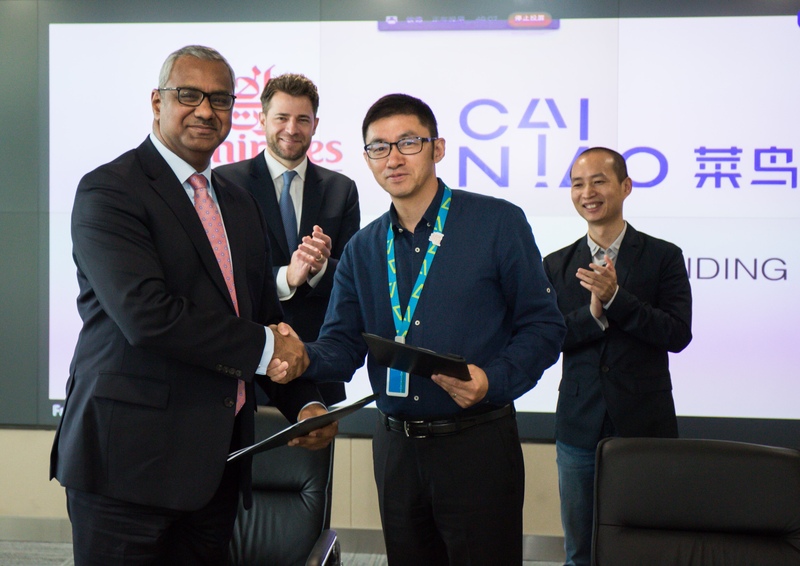 Dubai, UAE, 2018-Jun-15 — /Travel PR News/ — Emirates SkyCargo, the freight division of Emirates and the largest international cargo airline, has signed an MoU with Cainiao Smart Logistics Network Ltd. (“Cainiao”), the logistics arm of the Alibaba Group, to jointly facilitate the delivery of cross-border parcels as Cainiao looks to expand its global logistics infrastructure with Dubai as a hub. The MoU was signed by Nabil Sultan, Emirates Divisional Senior Vice President, Cargo and Xiaodong Guan, General Manager of Cainiao Global Business at Cainiao’s global headquarters in Hangzhou. It is a landmark agreement for both Emirates SkyCargo and Cainiao to leverage each other’s strengths in cross-border e-commerce trade and airline cargo operation. It will also support Cainiao’s broader efforts to offer enhanced customer experience. Cainiao recently unveiled plans to develop six global hubs in six cities around the globe. Dubai is one of them. Under the terms of the MoU, Emirates SkyCargo and Cainiao will work closely to manage e-Commerce shipments in the Middle East and other neighbouring regions through Dubai. Further details of the tie-up will be announced progressively as they are developed by the two parties. E-commerce is one of the strongest growth areas for the air cargo industry globally. Emirates SkyCargo has been exploring opportunities to collaborate with players in order to offer value-added services over and above cargo capacity between airports, using the strategic advantages of Dubai as a hub. Emirates SkyCargo offers cargo capacity to over 155 global destinations on a modern all-widebody fleet of 267 aircraft including 14 freighters- 13 Boeing 777-Fs and one B747 F. Emirates operates two state of the art Emirates SkyCentral cargo terminals in Dubai to manage cargo from passenger as well as freighter aircraft. Emirates SkyCargo has developed a number of transportation solutions targeted at specific industry verticals. As a technology company, Cainiao leverages cutting edge big-data technology and open collaboration to build a global infrastructure that links all the logistics elements to improve delivery efficiency and customer experience for all players along the supply chain. Cainiao’s vision is to deliver anywhere in China within 24 hours, and across the globe within 72 hours. Emirates SkyCargo is the largest international airline cargo operator in the world. With an unrivalled route network, we connect cargo customers to over 150 cities in 83 countries on six continents and operate in many of the world’s fastest developing markets. Our cargo hold capacity comprises Emirates’ fleet of over 255 aircraft, including 14 freighters – 13 Boeing 777-Fs and one B747-400ERFs. Emirates SkyCargo operates state-of-the-art cargo facilities at its dual hub locations in Dubai International Airport (DXB) and Dubai World Central (DWC) with cargo being moved 24/7 by truck between the two airports via a bonded virtual corridor. Emirates SkyCargo offers specialised cool chain solutions for perishables and temperature sensitive product such as pharmaceuticals. The carrier operates the first and the largest GDP certified multi-airport hub in the world with 8600 square metres of dedicated space for pharmaceuticals across its hub. This entry was posted in Airlines, Airports, Business, Transportation, Travel, Travel Management, Travel Services and tagged airline cargo operation, airlines, airports, Cainiao Smart Logistics Network, Cargo, e-commerce trade, Emirates SkyCargo, Mr Nabil Sultan, parcels, trade, Xiaodong Guan. Bookmark the permalink.